For I the LORD do not change. So you, the descendants of Jacob, are not destroyed. Malachi, believed to be a contemporary of Ezra and Nehemiah in the post-captivity era, is known to be the last of the minor prophets, where after which, the Lord kept silent for 400 years until the harbinger of Christ came – John the Baptist. The book of Malachi was written in a unique style – it almost reads like a court trial, and it is as much dialectic as it is didactic. Malachi first makes a charge, and then opens up the arguments against them, and finally ends the dispute by refuting the arguments. Note the number of questions asked in the book – questions that were answered. For I… But you ask… etc. In Malachi 3:6 we see another one of those. The premise is set – the Lord does not change, and because of that unchanging nature, the covenant is still in force. In today’s study we will focus on the unchanging nature of the Lord instead of the arguments and conclusions led by this premise, using a dialectic style much like Malachi. For I the Lord – read the Old Testament Bible, and you’ll realise that there is a lot of such statements made by the Lord. I am the Lord your God, and then a declaration [eg Isa 41:13]; I am the Lord who, and then an action [eg Gen 15:7]; Behold, I am the Lord, is anything too hard for me [Jer 32:27]. Why is that necessary? In today’s context it may seem extremely odd and redundant, because we have texts, and because the Lord doesn’t speak out loud anymore. But back in those days, it is not everyday that they get to read the text, it is not everyday that they hear prophets preaching the word of the Lord. They often fall back into sin, and yes, they often forget about God, only choosing to turn to him when they’re down and defeated. God is the Lord, and the emphasis is made again and again in the Bible before a strong declaration or a promise, which acts like a mark of guarantee on the declaration or the promise that the Lord makes. This is no trifling matter. Do not shrug this off. This is an important declaration. do not change – the unchanging nature of the Lord is well documented in the Bible. God does not change like shifting lights [James 1:17]; God is not human, that he should lie, not a human being, that he should change his mind [Num 23:19|Article]. But you remain the same, and your years will never end [Psa 102:27]. 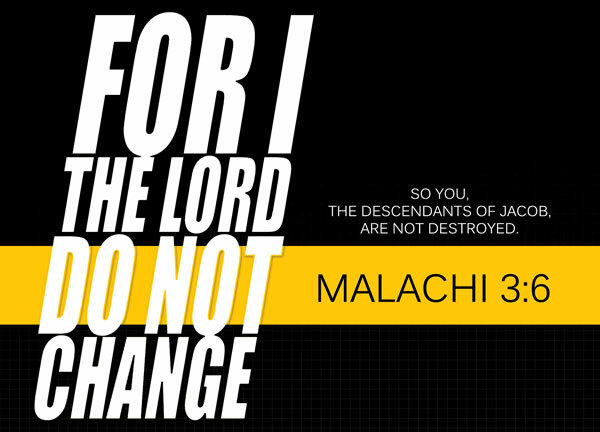 Why is the fact that the Lord do not change a premise in the book of Malachi? So what if the Lord does not change? What does it mean for us? To the Israelites, it is the same theme that pops up so often in the Old Testament – the covenant that the Lord has made with his people still stands, even if his people has betrayed him, because the Lord is faithful, and he does not change. For us, it really means the the word of the Lord, the Bible, is reliable, because God is consistent, a constant, and he does not change. That’s a very big difference, you know? Ask the big name authors and writers of this world. People like CS Lewis, people who write books based on their philosophy and beliefs at a younger age, and you see a huge difference between their writings at a younger age and their writings at a much later date. Try bump into a writer 10 years later after writing a book, and you may find that he may have regretted writing the book as his heart and mind changed, but there’s nothing he can do about that now. Their books were still selling out. Their names are still associated with that ideology that they no longer believe it. Can you imagine if God is like that, and he does change? In the Bible it says, do not covet. Tomorrow, it may be, you can covet within a certain set of conditions. It’s crazy to live. It’s unlivable. The truth cannot fluctuate, the truth is not volatile. God does not change, because he is the truth. So you, the descendants of Jacob, are not destroyed – this again alludes to the covenant and the promise that the Lord made to the Israelites. In retrospect, this perhaps also acts as a final promise and a comforting promise for them to cling on to in lieu of the radio silence that they will be subjected to for the next 400 years – after all, the first few verses of this chapter was about the messenger – the harbinger of Christ, obviously John the Baptist – the one who broke God’s silence after 400 years. But at that moment, looking at the prior themes and arguments in chapter 2, it is really talking about the unfaithfulness and sins of the Israelites which demanded their own destruction in all sense of the word. Yet, the only reason why they were not completely annihilated or wiped out, was really because God honours his covenant. The Bible was written a very, very long time ago. The era of Malachi was a very, very long time ago. Yet, because of attributes like his unchanging nature, the passage of time does not matter – his words and his commands still stay the same, and still applies to us today. The context may change, our situations may differ, but the challenges and the solutions are always the same – to separate ourselves from the secular worldly lifestyle and to turn back to God and God alone. God does not change. Men obviously changes – it would be sad if Men never changes, for it means we’d all be quite lousy people with no hope of becoming better. But because Men changes, they are scarcely reliable. Let us rely on God and his unchanging nature instead.